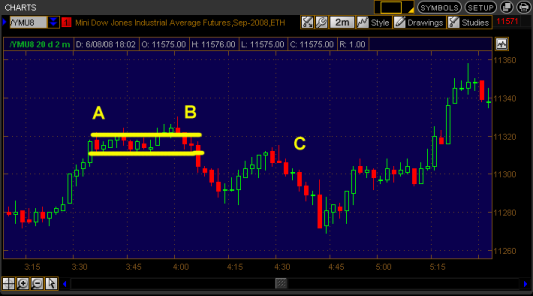 In this first example, area A formed sideways price congestion. 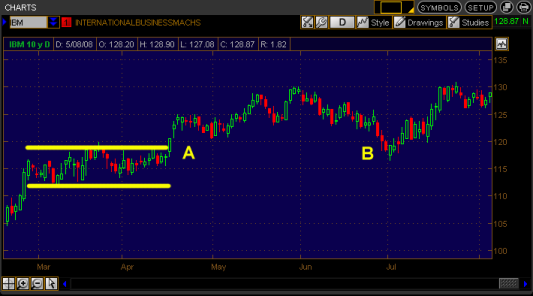 When price returns to that area at B, you are offered a higher probability and lower risk trade short. How does this work? Expectation of the area potentially forming resistance will lead some traders who are long in the rally up towards B to take profits in anticipation of resistance, or at least tighten their stop to exit if B does hold. Expectation of the area potentially forming resistance will lead other traders to place an entry short, to capture the profits on any move back down. And some of the traders who had gone long back in the congestion area A, and endured the gut-wrenching drawdown between A and B, would be gratefully accepting the opportunity to get out at breakeven in the vicinity of B. Each of these three traders will be acting with a sell order, increasing supply in the vicinity of B, and thereby increasing the likelihood of the potential resistance area holding. This increases the odds of a profitable trade (higher probability). A lower risk trade is offered through the ability to place the stop loss at close range, just beyond the upper boundary of resistance. This second example (above) is essentially the same setup as the first. 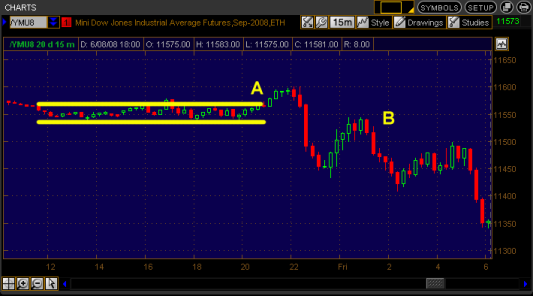 Price area A to B forms a congestion area, a sign of possible resistance if price returns to that zone. When price gets there at C an increase in supply will form due to some long traders taking profit, other traders entering short on first evidence of a stall, and others exiting their long trades at breakeven after enduring a drawdown from their long entry in the congestion area near B. This increased supply increases the likelihood of the resistance area holding, and of price falling again from area C.
The third example (below) shows a setup I absolutely love – pre-session trading forming a really nice congestion zone. Price then breaks out of that area of congestion at A. If price gets back to that zone I will operate with an expectation of support holding, affording me a higher probability, lower risk trade. It doesn’t take long for the rewards to come. Less than 30 minutes after the breakout, price has returned to the same area. Some traders short, perhaps scalping a short trade from the swing high back to support, will be covering their position and taking profits. Others will be entering long on first evidence of stall in this area. And others, who entered short in the congestion at A, will take the opportunity to exit at breakeven at B and relieve themselves of the pain of drawdown. All these transactions involve a buy order, adding to demand at this level, and increasing the likelihood of the potential support area holding. The next example is reversed. 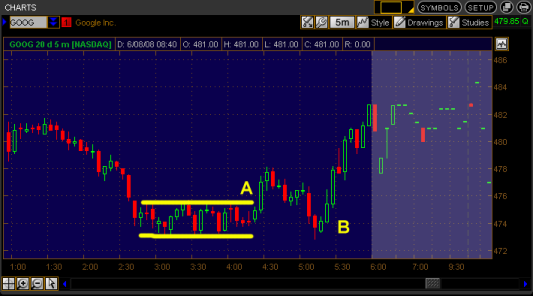 Once again it shows the pre-session price action in a very tight sideways congestion. This time though price has a false break-out long before moving to lower prices. This sets up a great opportunity back at that level if price should return there. The return occurs at area B, where resistance holds due to some profitable longs (scalping a trade from the swing low) selling to lock in their profit, other traders selling to enter short in anticipation of the level holding, and due also to the sell orders from some of the longs who entered at A, suffered through drawdown, and took the opportunity to exit at breakeven at B.
There’s no shortage of opportunity in the markets. Let’s check some different timeframes and different instruments. 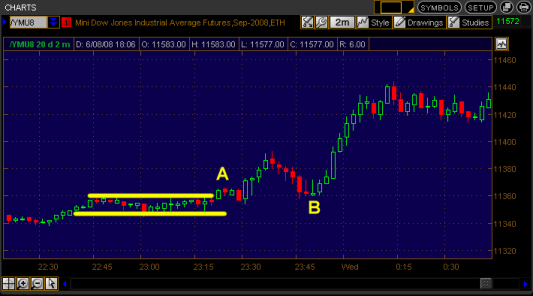 The above chart is the e-mini Dow 15 minute chart. Congestion area A holds when price returns there following an economic news release at B, and again an hour and fifteen minutes later on the volatile session opening candle. And above, you’ll find a 5 minute chart of Google (you might have heard of them). Congestion at A leads to a great opportunity for a trade in the long direction, when price returns there at B. 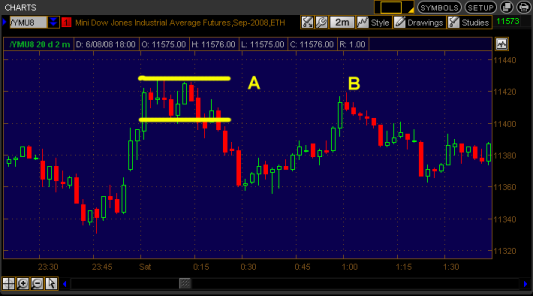 And, let’s wrap it up with two final demonstrations of how this concept applies on daily charts as well. 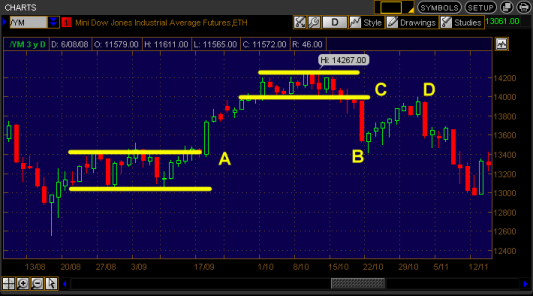 The first (above) is the daily e-mini Dow chart. Congestion at A led to a great trade long at B, and congestion at C led to a great trade short at D.
I don’t know about you, but I love this stuff!!! Solid sideways congestion between late February and mid April lead to a great trade in the long direction when support held at B in July. Have a look through your own charts for some of these setups, and try to see how these areas can potentially provide you with a lower risk, higher probability trade. Coming up in the next support and resistance installment – something a little different – round numbers.